FILE - Bill Priestap, assistant director of the FBI Counterintelligence Division, testifies on Capitol Hill in Washington, July 26, 2017. On Dec. 12, 2018, Priestap said China posed "the most severe counterintelligence threat facing our country." Top U.S. officials are sounding new alarms about China, warning that Beijing, more than Russia, poses the most serious long-term threat to the United States. The officials, from the FBI, the Department of Homeland Security and the Justice Department, say the Chinese are increasingly targeting U.S. vulnerabilities in cyberspace, as well as leveraging some members of the Chinese diaspora to steal secrets and threaten U.S. national security. "This is the most severe counterintelligence threat facing our country today," Bill Priestap, assistant director of the FBI's Counterintelligence Division, told the Senate Judiciary Committee on Wednesday. "We need an even broader response," he said, warning that U.S. actions to date have not been adequate. "What hangs in the balance is not just the future of the United States, but the future of the world." Justice Department officials said that between 2011 and 2018, more than 90 percent of the department's nation-state espionage cases involved China, and that the pace of Chinese operations was increasing. FILE - Assistant Attorney General for National Security John C. Demers speaks during a news conference to announce a criminal law enforcement action involving China, at the Department of Justice in Washington, Nov. 1, 2018. Justice Department and FBI leaders announced criminal charges and an operation to thwart Chinese economic espionage. "The playbook is simple: Rob, replicate and replace," Assistant Attorney General John Demers told lawmakers. "Rob the American company of its intellectual property, replicate that technology, and replace the American company in the Chinese market and one day in the global market." Priestap and Demers were neither the first nor the most high-ranking U.S. officials to warn of the threat posed by China. In September, U.S. Director of National Intelligence Dan Coats cautioned that Beijing's "methodical" approach, combined with its prowess in cyberspace, was more dangerous to the U.S. than Russia's election-meddling efforts. "China benefits from a relatively stable U.S.-China relationship and international system that is more predictable and less contentious," Coats said at the time. But the latest warnings came as the U.S. is locked in a trade dispute with Beijing, and with tensions rising over the detention of a key Chinese communications executive. 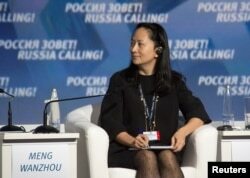 Huawei Chief Financial Officer Meng Wanzhou was picked up in Canada and is free on bail as she awaits possible extradition to the U.S. on charges of fraud involving U.S. sanctions against Iran. China has demanded her release, and U.S. President Donald Trump told the Reuters news agency Tuesday that he would consider intervening if it would benefit U.S. national security or allow him to close a trade deal with Beijing. 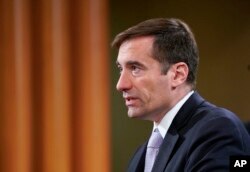 Pressed during Wednesday's Senate Judiciary hearing on whether Trump's comments could harm U.S. efforts to hold China accountable, Demers insisted there would be no impact on the Justice Department's actions. "What we do at the Justice Department is law enforcement. We don't do trade," Demers said of Meng. "We are not a tool of trade when we bring the cases." Regardless of the outcome of the case or U.S.-China trade negotiations, U.S. security and intelligence officials believe the threat from China will continue to grow. FILE - The U.S. Department of Homeland Security's Christopher Krebs speaks during a news conference on election cybersecurity, Oct. 19, 2018, in Arlington, Va.
"Our economy is built on a common fabric of cross-cutting systems. 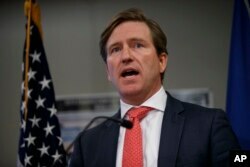 To our adversaries, including China, this is a vast web of interconnected targets," Chris Krebs, director of Homeland Security's Cybersecurity and Infrastructure Security Agency, told lawmakers Wednesday. One of the latest victims of Beijing's opportunism appears to have been Marriott, the U.S.-based international hotel chain, whose database, including personal and financial information and passport numbers, was hacked in September. Reuters, The New York Times and other U.S. news outlets, citing government sources, have reported the breach carries the hallmarks of Chinese intelligence rather than criminal activity. The reports said the hackers are suspected of working for China's Ministry of State Security, based on the similarity of their methods to those in previous Chinese incursions. A spokesman for China's Ministry of Foreign Affairs told the Times, "China firmly opposes all forms of cyberattack and cracks down on it in accordance with the law." He said if evidence was offered, Chinese officials would investigate. However, the threat from China goes beyond hacking, cyberattacks and intrusions. Officials said Beijing was also using some members of the Chinese diaspora, such as tech workers and students, to help target U.S. companies, universities and other research institutions. "They think of them as simply an extension of their power," the FBI's Priestap said of the Chinese nationals in the U.S.
"Some, I think, are not knowledgeable in the least and are completely unwitting of doing anything in furtherance of their government's aims," he said. "Others, either through direct or other softly applied pressure, understand that they have an obligation to meet."